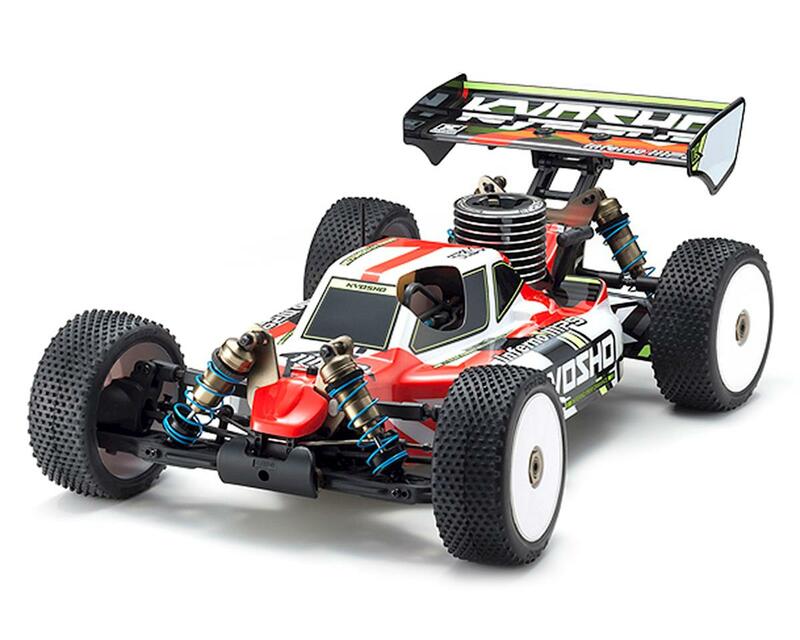 The Kyosho Inferno MP9 TKI4 ReadySet 1/8 Nitro Buggy includes the DNA of the competition-level MP9 TKI4 kit model and its advanced racing technology is embodied in this Readyset. The MP9 TKI4’s long front suspension arms and 17.5° caster front hub carriers create superior cornering and sharp control. The cab forward body increases downforce, giving the TKI4 an aerodynamic performance advantage and delivers balanced cornering and optimal traction. 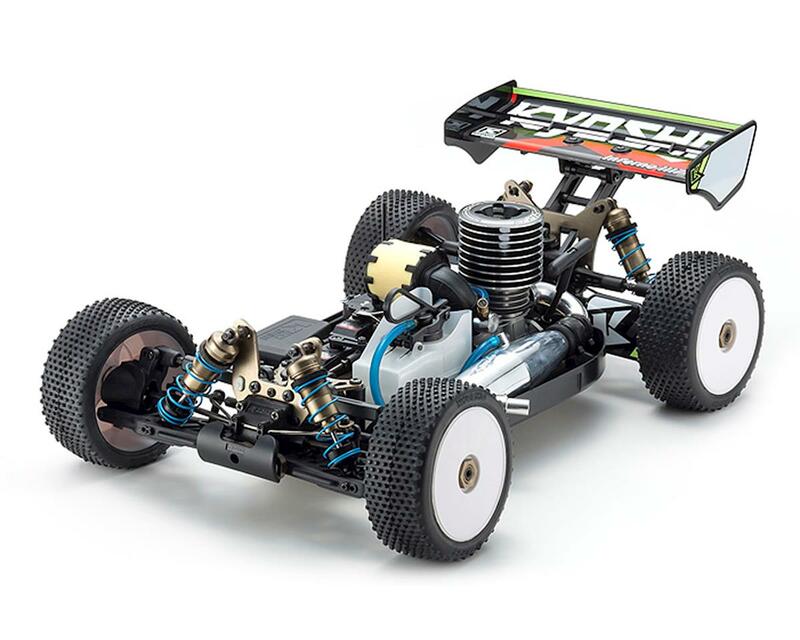 Inclusion of the user-friendly and high torque KE21SP engine fitted with recoil starter and tuned exhaust, anyone wishing to challenge the peak of 1/8 engine buggy performance can find the perfect racing partner in this MP9 TKI4. Both steering and throttle are equipped with high-torque metal geared KS5031-09MW servos. Wide variety of available option parts provides extensive range for tuning on track performance. Glow plug was bad and had to replace it for first start but other than that it's a very well built buggy. Engine broke in without and issues. Has great power and very exciting to operate. The handling is superior and very predictable. Great buy would highly recommend. I am ordering more parts for this car from Amain right now and thought I would share my experience thus far. Could not physically turn over the engine for first start and knew it was not due to being tight. Took the engine out, clutch apart and found the flywheel mounting cone and washer were not there so the flywheel was smashed against the front of the crankcase. Decided to go thru the whole car and found that not only is there no oil in the diff's, but they smeared so much white silicone sealant on the gaskets that it has covered the gears with the stuff. The antenna was destroyed right out of the box and is a special size specific to Kyosho. The wheel bearings are loose and need to be shimmed. There was a small dent on top of the pipe, but upon removing the engine I found that there are actually five dents in it. The body cannot be removed with ANY ease without significant cutting around the front shock tower and cooling head. Most of the screws checked or removed so far were loose with no lock-tite. After having this for a week I have a pile of parts and three orders to Amain for parts. NOT real impressed!